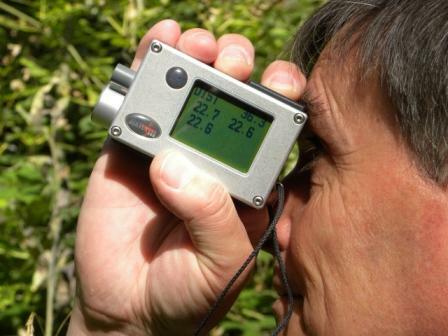 Tree height was calculated using trigonometry from measurements taken using a hypsometer - a type of clinometer. In the photo below you can see Ian, a scientist from Forest Research, using the hypsometer. If you look carefully at the screen of the hypsometer you can see the distance to the tree (D) is 36.3m, and there are three different readings for height (A). The hypsometer has already worked this out because an internal sensor calculated what angle (a) was. Ian knew that height (B) was 1.3m (because he could easily measure this). So the total tree height was A (22.6m) + B (1.3m) = 23.9m. Based on the estate records of Blenheim Palace we had thought that the trees in the plantation containing the OneOak tree were probably planted in the 1850s. Once that the tree had been felled we were able to use dendrochronology or tree-ring counting to provide an exact date. Leading dendrochronologist Daniel Miles, of Oxford Dendrochronological Laboratory, collected seven discs from the main tree stem and from one branch immediately after felling. Our original estimate that the tree was about 160 years old, based on estate records, proved to be very inaccurate. The lowest disc, taken about 30 cm above ground level, proved that the tree was 30 cm tall in 1790. The tree probably generated naturally in 1788: making it 222 years old when felled in 2010. The stem diameter of trees is always measured 1.3m above the ground - this is called diameter at breast height (dbh). It is possible to calculate the diameter if you use an ordinary tape measure to record the circumference (diameter = circumference / π). Foresters use a diameter tape, which is marked with this calculation built in. Here you can see Ian measuring the dbh with a diameter tape. We now know our tree has a dbh of 89.8cm. We stood underneath the tree and using a clinometer to sight vertically upwards into the tree's crown, we stood exactly under its outer edge. We then measured from this point to the tree stem. We did this at eight different points around the tree. When these are plotted on a graph, it is interesting to observe that our tree had a much smaller canopy on its northern side. This will be because the tree will have had much less sunlight on that side. By adding the eight crown radius measurements together and dividing this number by eight, we can calculated that the average canopy radius is 8.9m. If we double this figure, then the average crown diameter is 17.8m. Using the same techniques as for the tree height, we have measured the timber height at 12.9m. How did we know where to measure to? Using an experienced forester's eye! Looking carefully at the tree it is possible to see where the main stem bends and becomes too branched. Beyond this point it would not be possible to cut straight timber from the tree. It is important to estimate how much timber we may be able to harvest from the tree. The maths is not as hard as it looks but the main problem is that R2 refers to the radius of the stem at the top - i.e. 12.9m up the tree and we don't know that. Foresters have developed some clever charts that make it possible to estimate volume from just the stem diameter (dbh) and timber height - and we know both those values. The Forestry Commission "single tree tariff chart" for oak tells us that with a dbh of 90cm and a timber height of 12.9m the OneOak's timber volume ("overbark") is 4.96m3. 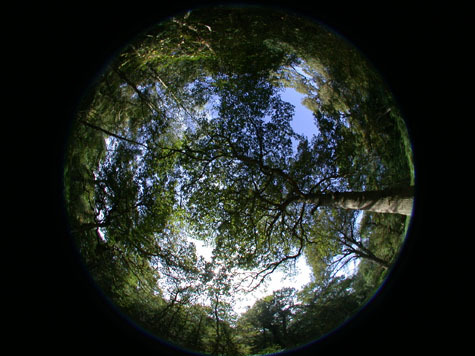 After taking the spectacular images of the tree canopy with the hemispherical camera lens (see blog post of September 18th), Forest Research scientists then used special software to calculate how much of the sky was visible underneath the tree in this image. 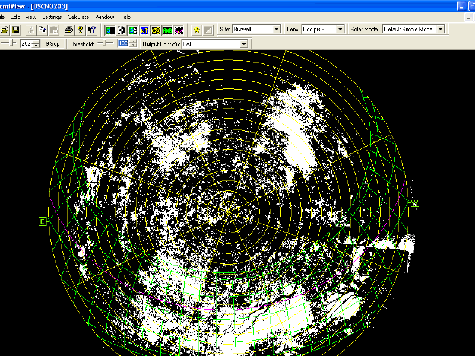 The second image shows a screen shot of the software being used on the same image. Leaf Area Index or LAI is the ratio of total upper leaf surface of vegetation divided by the surface area of the land on which the vegetation grows ( read more ). Forest Research calculated that the LAI for OneOak was 1.7. LAI values can range from 0 (no cover) to 6 (dense forest cover). Apparently our result of 1.7 is quite low for a mature broadleaved woodland. Scientists will now use this value in future calculations of the tree's biomass. Foresters use tables to estimate the volume and weight of timber from a tree but these only apply to the main stem of a tree, excluding the crownwood (branches). To calculate the entire weight of the OneOak tree a team of scientists from Forest Research weighed every limb, branch and twig of the tree. To weigh the crown of the tree, bundles of wood were suspended from the loader of a tractor in a large sack attached to a spring balance. The main stem of the tree, which had been cut into three lengths, was weighed at a road bridge when it was tranported to the sawmill. 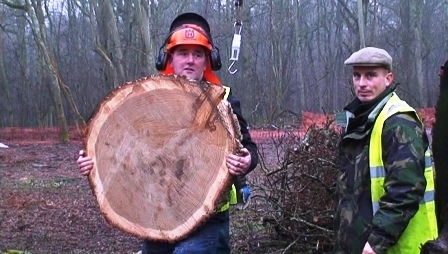 The total weight of the tree was 14,385kg (14.385 tonnes). The total branchwood actually weighed more than the tree's massive stem; at 8,349kg it was 58% of the total weight. You can read more of the story about how we weighed the tree, and about the competition we held during 2010 when people tried to guess the tree's weight here. Volumes were estimated for the main stem and for branches greater than 7cm in diameter. After the tree felling, scientists from Forest Research took samples of the OneOak's wood to their laboratory. They used special ovens to dry the samples. This allowed them to calculate the moisture content of the samples: these ranged from 43.2% in the main stem, to 50.0% in branches under 4cm in diameter. The total oven dried (OD) weight, or dry mass, of the tree was estimated to be 7.86 tonnes. The main stem OD weight was 3.43 tonnes, and the crown 4.43 tonnes. The OD weight was used to calculate the carbon content. The total carbon embodied in the tree, estimated by Forest Research, was based on dry mass, i.e. after oven drying. The above ground dry mass was 7.86 tonnes. It is normally assumed that 50% of dry biomass is carbon, therefore the total above ground carbon in the OneOak tree was 3.93 tonnes (C). Best estimates for the below ground biomass (i.e. the roots) and carbon suggest that root biomass was 2.061 tonnes dry weight. Added to the above ground figure the total tree biomass was therefore 9.923 tonnes dry weight. So the total carbon embodied in the OneOak tree, including the roots, was 4.962 tonnes C.
Thirty five oak boards were cut from the three main sections of the OneOak tree by local sawmill Deep in Wood. These are air drying prior to use by dozens of wood users who will make items during 2011 and 2012: ranging from fine furniture, a door, a boat, and a beam in an oak-framed building, to green working and crafts, to firewood logs and chip for heat. Some of these products will be followed in detail to calculate their carbon footprints by specialists Best Foot Forward.